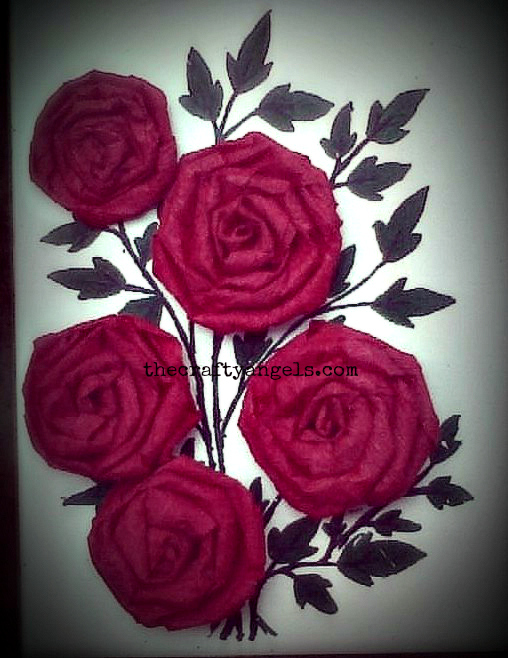 I have myself tried the much hyped about tissue paper roses (click here for tutorial) and it turned out to be a huge success(atleast at my home :P). In a parallel universe, my sister made the exact same kind of crepe paper rose flowers – the only difference being that the flowers dint have a stem and was put up on a canvas with painted leaves.What i loved about the whole work was not the process ( its there all over the internet!) but the way it was finally put up. I have hardly seen any crepe paper rose flowers anywhere other than on a kissing ball or flower vase. I liked her idea of mixing art and craft 🙂 Here are some pics she shared with me of the crepe paper rose flowers and also a quick tutorial. Cut out your crepe paper into long strips or you can use crepe paper streamers used for decorations. Crepe paper sheets gives you the freedom to choose the width of strip which is in turn the size of the crepe paper rose flower. Like in the picture above, fold the corner of your strip to for a bud ( I guess you can even make a bud from another piece of crepe paper and glue it to the middle). Once you have the bud and strip in place, all you have to do is twist and wrap, twist and wrap over n over till you get your crepe paper rose flower in shape! Glue the ends to the flower and there you go-ready to make a kissing ball or wreath or a mixed art piece like this!